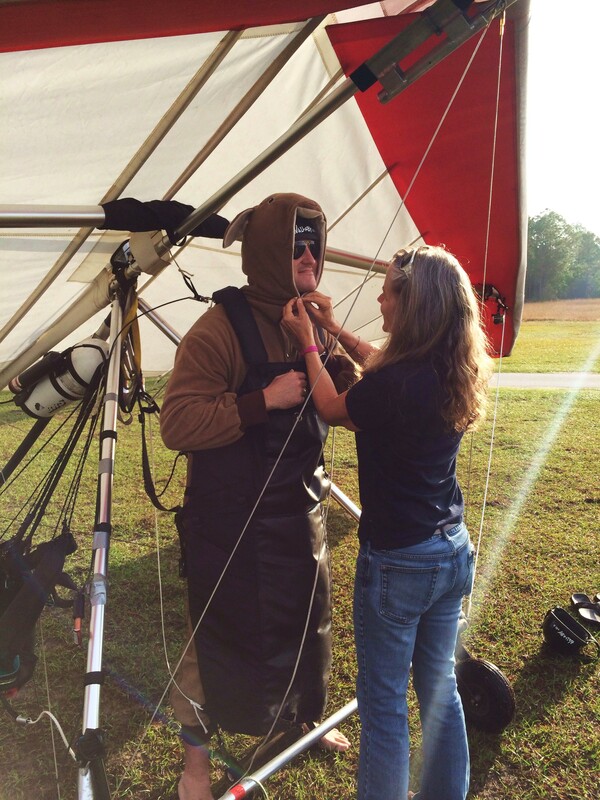 or: How a Simple Misunderstanding Led to a Grown Man Hang Gliding in a Kangaroo Costume. 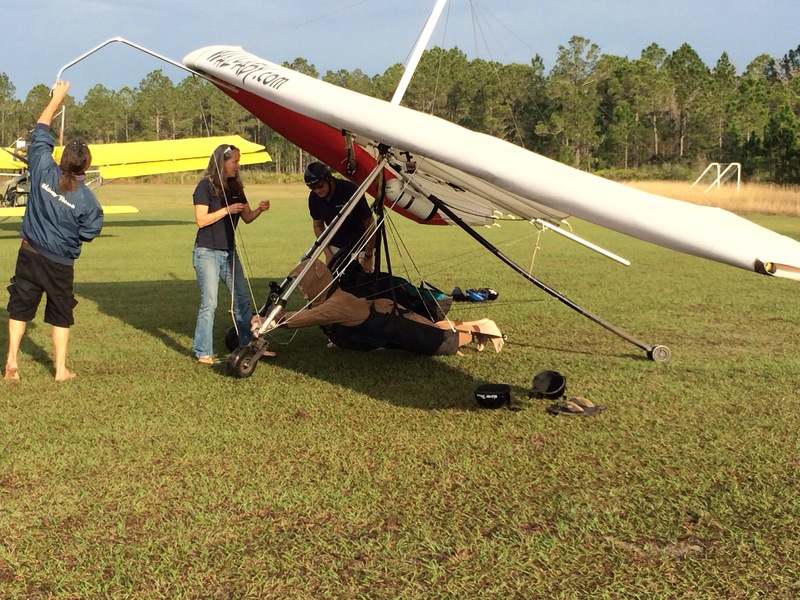 DISCLAIMER: A simple Google search will inform you that Central Florida's Wallaby Ranch is a facility that specializes in breathtaking, tandem aerotow hang gliding adventures. It is NOT; however, a literal ranch for wallabies. What you are about to read was written by a man with a child-like passion for marsupials and a lack of basic journalistic skills. His clueless behavior in no way reflects the views or opinions of TodaysOrlando.com. Full disclosure: I love kangaroos! They are hands-down my favorite animal. They can jump, they have pockets, they know how to box, and they have cool Aussie accents. So when I got the email that I'd be visiting Wallaby Ranch here in Central Florida, I didn't even read past the subject line: I was in! 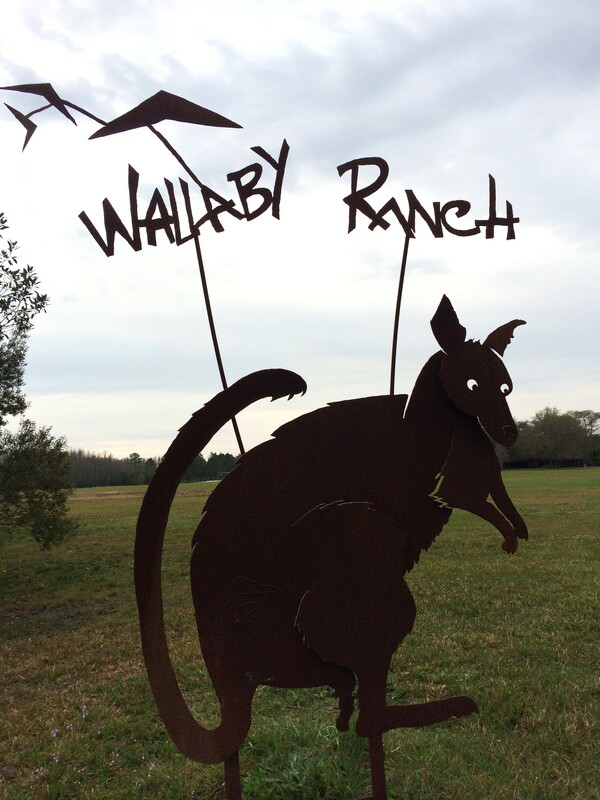 A wallaby ranch in Orlando?! How did I not know about this? An up close and personal experience with furry, adorable, miniature kangaroos is something I've always wanted to do, and based on the name alone, I knew I was in for a treat. I woke up early on the day of my visit to Wallaby Ranch – already dressed in my adult kangaroo costume that I swear I didn't already own. The facility is located in Davenport, about fifteen minutes south of Walt Disney World, so the scenic drive out to the ranch was an easy trip for this annual pass holder. After turning off I-4 at ChampionsGate Golf Club, I followed county road 54 (Ronald Reagan Parkway) west until I saw the sign I'd been looking for. 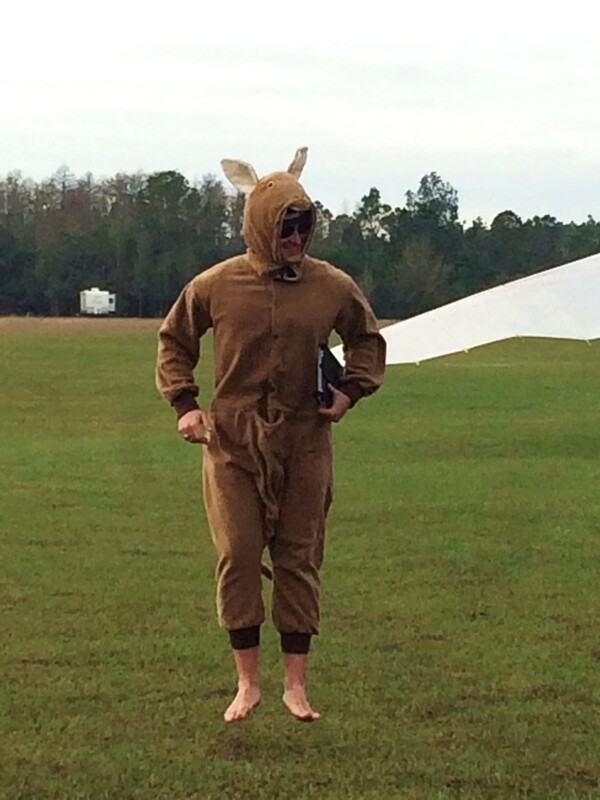 When I arrived dressed as a kangaroo, I was welcomed by perplexed faces and blank stares. "Did one of the kangaroos get loose," they must have thought? Giddily, I explained to the staff that, much like them, I'd come from a long line of marsupial lovers. Just as my Dad grew up on Captain Kangaroo, I religiously watched Rocko's Modern Life, and now my daughters' favorite Winnie the Pooh characters were Kanga and Roo! They were so amazed by my infectious excitement that they couldn't help but point, laugh and shake their heads in disbelief! It was so fulfilling to finally be around a community of like-minded Kangaroo aficionados. I was then greeted by Wallaby Ranch founder and owner, Malcolm Jones. A good sport and very generous host, Malcolm was taken aback by my appearance at first glance. TD: "Hey Malcolm, thanks for having us out." MJ: "You're welcome. What's with the costume?" TD: "I'm glad you brought it up. I figured by disguising myself as a mother kangaroo, I could gain up-close access by seamlessly integrating into a mob of wallabies after being accepted as one of their own. MJ: "What? There are no wallabies here." TD: "Of course not here, they're out on the ranch." MJ: "No, no. We provide aerotow hang gliding adventures." TD: "...to get the best views of the wallabies. I hear 'ya." MJ: "You seem to be confused. Wallaby is just the name of the ranch." I must admit, at this point it was hard to concentrate on what Malcolm was saying when all I could think about was interacting with my favorite animal. After a few seconds of silence, Malcolm walked away – probably to address pressing wallaby business. Nevertheless, I was absolutely thrilled! Not only was I going to get to meet my spirit-animal, but I was also going to get to hang glide?! My to do list was crossing itself off! Before I took to the skies, I was instructed to empty my pockets... all of them. Unfortunately, little Joey had to sit this ride out. I was then invited to strap into a hang glider and soar high above the Wallaby Ranch in what I assumed was the best way to examine the wallabies in their natural habitat. Once Malcolm was securely strapped-in behind me, we were good to go. After getting the signal, our tow-plane advanced down the runway – tightening our tow-line. Within seconds we were off the ground. During our ascent, cool gusts of wind filled the hang glider's wings as we smoothly lifted into the air. Soon, we were hundreds of feet above ground. It was a peaceful and serene experience, but even now as I recall this moment, my palms are sweating. It was early in the morning that day, so if I wasn't already fully awake, I was then. It turns out that Wallaby Ranch is also the first and largest aerotow hang gliding flight park in the world and has been providing guests with soaring hang gliding adventures for over 20 years. The ranch is unique in its approach to hang gliding, which traditionally involved hauling a hang glider up a cliff and jumping off. Malcolm's concept to combine aerotowing with wheeled-hang gliders revolutionized the sport. Now, Wallaby Ranch can offer guests Tandem Discovery Flights and certified Aerotow Tandem Instruction everyday thanks to Orlando's naturally sunny weather and excellent flying conditions. Also, with pilot-facing and wing-mounted GoPro cameras, guests can leave with a quality DVD recording of their incredible flight for a additional fee. I have to say, I was beyond impressed. "With all of this hang gliding business, how do they find the time to care after the wallabies," I wondered? I don't know how they do it, but Malcolm is running one amazing operation! Back in the air, we glided together over tree-tops and farmland. Cradled safely in the protective pouch of the hang glider, I appropriately became the Joey to Malcolm's Mama Kangaroo. It was an interesting parallel and an intimate bond that Malcolm repeatedly refused to acknowledge. It happened, Malcolm. It was real. After circling up to nearly 2,000 feet, we detached from our tow plane. There was a slight pull followed by a momentary plunge. We were then free to drift on our own as the small tow plane (or "tug") spiraled back to the ground below us. It was at this point that Malcolm informed me that I was piloting the hang glider. He demonstrated this by instructing me to steer left by extending the pole with my right arm and pulling with my left, and vice versa. As I scanned the tree-covered grounds for my favorite furry creatures, my eyes could not be kept from the view of Florida's beautiful landscape. From this height, I could make out local landmarks like Downtown Disney and the spherical Spaceship Earth at EPCOT. The wind was calm and the sun shined bright over the horizon as we glided through the air. I fittingly wore my trademark Ray-Ban Aviators after being assured that they would not fall off my face. Not only did they look cool, but they also helped conceal what I called "wind-produced tears" from running down my cheeks. Again, I must credit Malcolm for not making fun of me for crying. It was just so beautiful. We circled high over the ranch for nearly fifteen minutes. With each pass, we wound closer to the ground. The landing was smooth thanks to the wheeled aircraft and Malcolm's expertise. 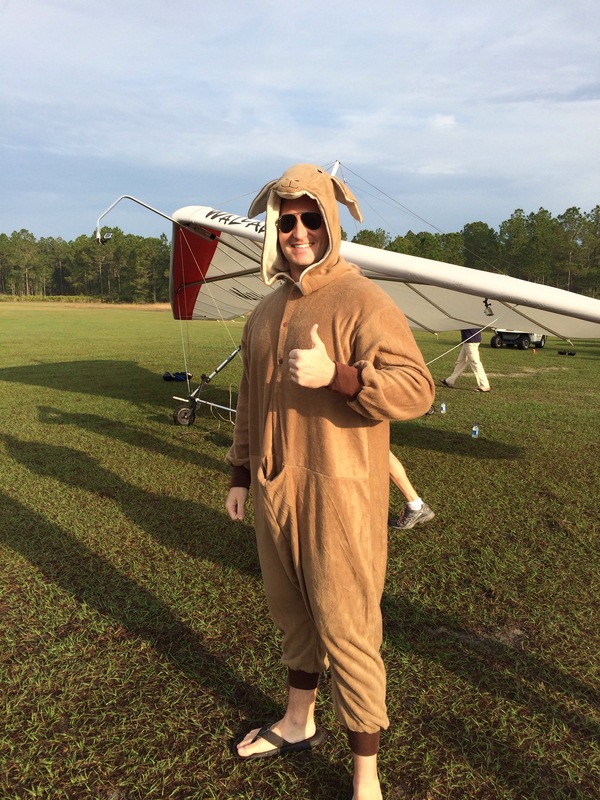 With over 30,000 incident-free tandem flights under his belt, Malcolm is so experienced that he can land on a dime. I did not see any actual wallabies during my visit, but it was such a thrilling experience to soar high above beautiful Central Florida that I almost forgot to look for them. Perhaps they were sleeping or perhaps my costume was too alarming to the small creatures. Regardless, Wallaby Ranch provided me with a lasting bird's-eye memory and a one-of-a-kind adventure that this kangaroo won't soon forget. Hopefully, I can return my kangaroo costume for a full refund even though the front pocket smells like Dunkaroos and half a can of Fosters. Need a place to stay close by Wallaby Ranch? Check out The Omni Orlando Resort at ChampionsGate's luxury accommodations for both hang gliders and kangaroo-lovers, alike. Perhaps you feel like unwinding once you're back on solid ground. Visit Mokara Spa at Omni Orlando Resort for relaxing massages, facials, manicures and pedicures at the end of your long g'day. Travis Dale is a native Floridian, a writer, a Gator, a husband and a dad.